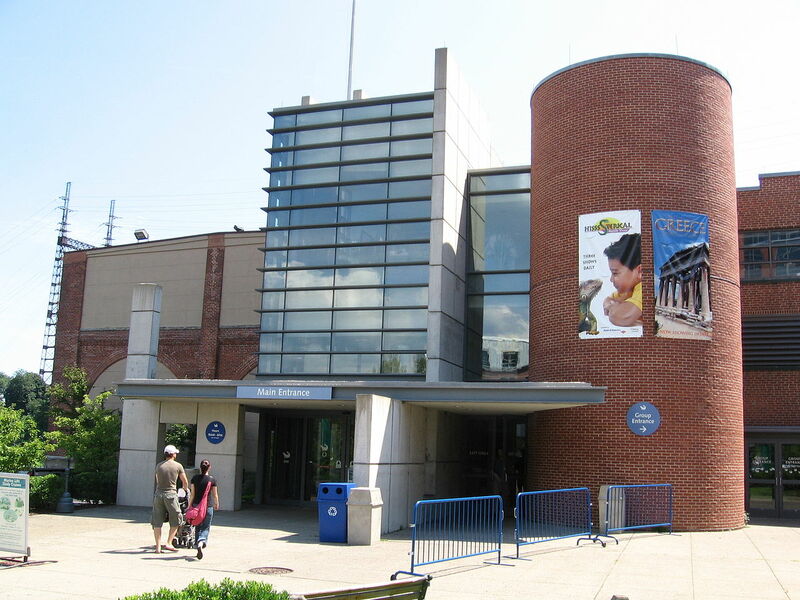 The Maritime Aquarium is located at 10 North Water Street, Norwalk, CT 06854. Some GPS devices and computer map programs point to the IMAX® Theater entrance to our facility. The parking garage and Main Entrance are one block north near the intersection of Ann and North Water streets. I-95 Northbound. Exit 14 in Connecticut, Reed St. Go straight at two stop signs and continue down the hill to stop light. Go straight at the light (changes to North Water St.), under the RR overpass and follow the road as it bends to the right along the Norwalk River. At the first stop sign, you’ll see the Aquarium straight ahead and the parking garage to your right. I-95 Southbound. Exit 15. Exit ramp splits: first stay to right following signs for South Norwalk, then stay left as you come to a "T." Left at light on to West Avenue. Turn left at second light, (double left turn lanes) onto North Water St. Go under the RR overpass and follow the road as it bends to the right along the Norwalk River. At the first stop sign, you’ll see the Aquarium straight ahead and the parking garage to your right. The Merritt Parkway Northbound. Exit 39A onto Route 7 south. At end of Route 7, take middle exit (for South Norwalk). Right at light onto West Avenue. Turn left at first light. Go under the RR overpass and follow the road as it bends to the right along the Norwalk River. At the first stop sign, you’ll see the Aquarium straight ahead and the parking garage to your right. The Merritt Parkway Southbound. Exit 40B. Right at light on to Main Avenue. At the light at the Dept of Motor Vehicles, take a left onto Grist Mill Road, then the second left onto Route 7 South. At end of Route 7, take middle exit (for South Norwalk). Right at light onto West Avenue. Turn left at first light. Go under the RR overpass and follow the road as it bends to the right along the Norwalk River. At the first stop sign, you’ll see the Aquarium straight ahead and the parking garage to your right. The Danbury Area. Take Route 7 south. Just after entering Norwalk, watch for the Starbucks on your right, then take your next right on to Grist Mill Road. Take the second left on to Route 7 South. At end of Route 7, take middle exit (for South Norwalk). Right at light on to West Avenue. Turn left at first light. Go under the RR overpass and follow the road as it bends to the right along the Norwalk River. At the first stop sign, you’ll see the Aquarium straight ahead and the parking garage to your right. Take the Tappan Zee Bridge to 87 East. Take that to 287 East. At the end of 287, take the Exit for I-95 North. In Connecticut, take Exit 14. Go straight at two stop signs and continue down the hill to stop light. Go straight at the light, under the RR overpass and follow the road as it bends to the right along the Norwalk River. At the first stop sign, you’ll see the Aquarium straight ahead and the parking garage to your right. From the Hutchinson River Parkway: Take the Hutchinson River Parkway (becomes the Meritt Parkway in CT). Use Exit 39A, Route 7 connector South. At the end of the connector, take the middle exit, South Norwalk/Maritime Aquarium. Take a right at the end of the ramp onto West Avenue. Turn left at first light. Go under the RR overpass and follow the road as it bends to the right along the Norwalk River. At the first stop sign, you’ll see the Aquarium straight ahead and the parking garage to your right. From Route 123: Follow Route 123 into CT (through New Canaan) and into Norwalk. Take the ramp on your right for the Route 7 connector South. At the end of Route 7, take the middle exit, South Norwalk/Maritime Aquarium. Take a right at the end of the ramp onto West Avenue. Turn left at first light. Go under the RR overpass and follow the road as it bends to the right along the Norwalk River. At the first stop sign, you’ll see the Aquarium straight ahead and the parking garage to your right. Coming from the The Tappan Zee Bridge: Follow the signs for 287 East to I-95 North to Connecticut. Exit 14 in Connecticut off I-95. Go straight at two stop signs and continue down the hill to stop light. Go straight at the light, under the RR overpass and follow the road as it bends to the right along the Norwalk River. At the first stop sign, you’ll see the Aquarium straight ahead and the parking garage to your right. From Route 87 / Route 287 East (and from Tappan Zee Bridge): If coming from Route 87 (NY State Thruway), take it across Tappan Zee Bridge to Route 287. At the end of Route 287, take the Exit for I-95 North. Take Exit 14. Go straight at two stop signs and continue down the hill to stop light. Go straight at the light, under the RR overpass and follow the road as it bends to the right along the Norwalk River. At the first stop sign, you’ll see the Aquarium straight ahead and the parking garage to your right. The Maritime Aquarium at Norwalk is one of the few in the country solely devoted to one body of water: in our case, Long Island Sound. The Aquarium features more than 1,000 marine animals native to the Sound and its watershed, including crabs, lobsters, jellies, sea turtles, shark and many more! 10:00 am - 5:00 pm every day of the year, except Thanksgiving and Christmas Days. Please note, they close early (3:00 pm) on Thanksgiving Eve and Christmas Eve days. Fun and education! Learn how the two are combined at the Maritime Aquarium. Check out the Maritime Aquarium website for other area attractions and local hotels that offer aquarium discounts to their guests.